As construction on Capitol Hill Station enters its final phases, the long closure at the north end of the Broadway Bikeway may finally open up in coming weeks month. But the true glory of the bikeway won’t be realized until it extends through the rest of the Broadway business district at least to E Roy. Plans for extending the bikeway which provides a safer route for bikers away from the dangerous streetcar tracks are linked to the First Hill Streetcar extension project, which is now in the design phase. That project construction remains underfunded, but the design for both the streetcar and bikeway will be shovel-ready in 2016. Planners are considering filling the funding gap through a Local Improvement District. SDOT officials along with consultant Alta Planning + Design recently presented the updated design ideas for the bikeway element of the plan at Seattle Bicycle Advisory Board meeting. Below is a block-by-block look at the plans as they are today. After many months of delays, Wonder Coffee & Sports Bar is now open at 19th and Jackson. They opened their doors for the first time Sunday, just in time for the Super Bowl. They are seeing how things go and are making adjustments to their menu and store hours. As of right now, they are aiming to open around 2 p.m. and go until late. The menu features typical American sports bar food (hamburgers, fries, onion rings, etc), but it also has some Ethiopian items (like zilzil tibs). 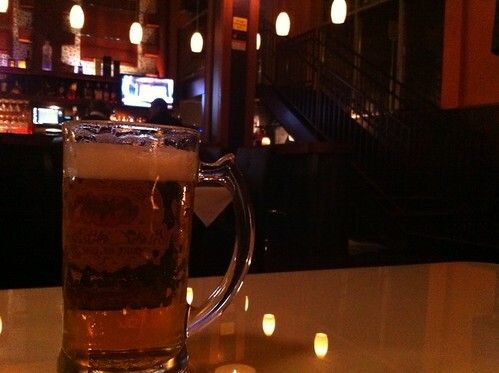 And of course, it has coffee, cold beer and a full bar. The bar also has a stage, a screen with a projector pointed at it and a private room with the front end of a car coming out of it. Swing by for food or drinks and say hi! A man shot two people inside the Twilight Exit at 25th and Cherry Sunday night before exiting the bar and firing at police officers outside. Police returned fire and killed him. The two people shot inside, a 25-year-old female and a bouncer in his 30s, were taken to the hospital with non-life-threatening injuries. 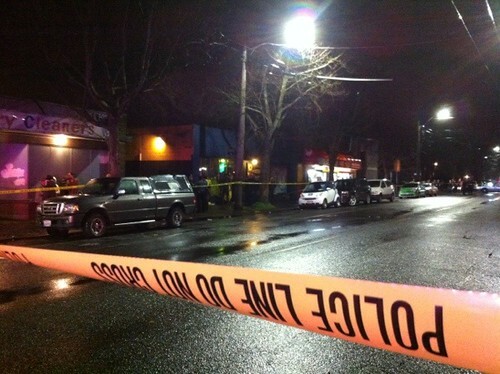 No officers were struck during the exchange outside the bar. The incident started around 10:15 p.m., according to police. There were at least 20 people in the bar when the suspect entered, apparently looking for the woman, who was an ex. After exchanging words, the man pulled out a gun and shot her. He also shot a Twilight Exit bouncer. When the suspect left the bar, police contacted him and told him to drop his gun. He lifted the gun and fired one shot at officers, police said. Officers then returned fire, striking him. Medics declared the suspect dead on arrival. The two victims inside were transported to the hospital. Witnesses gathered outside, and emergency responders gave them ponchos to keep dry from the light, cold drizzle as they waiting for detectives. A Metro bus arrived, and witnesses boarded to stay warm and talk to officers. They then left the scene in the bus, headed to station for further statements. The faculty of Garfield High School unanimously voted not to administer a standardized test mandated by the Seattle School District, a bold move that puts pressure on the District to rethink the test’s place in Seattle classrooms. Administration of the MAP test was scheduled to begin next week. Three teachers abstained from voting, and the rest voted to make the stand against a test they say is an ineffective distraction that neither helps students nor provides an accurate assessment of teacher performance. None voted against the idea. “Over and over, teachers say that this is not what we’re teaching in our classrooms,” said Jesse Hagopian, a Garfield High teacher who has taken an active role in opposing the test. “Students don’t have anything attached to this in terms of their grades,” he said. “Many get bored and just start pushing buttons.” This makes their scores on the computer-administered test go down, hurting the teachers whose performance is supposedly being assessed. But beyond criticisms of the test itself, administering it two or three times a year consumes a lot of precious time and resources and “monopolizes computer labs for weeks at a time.” This is particularly bad for the students who do not have access to a computer and Internet at home and depend on the school lab. Now, Hagopian and the Garfield faculty are not against assessment, but those tests should be more related to the materials they actually cover during class. “Portfolios and performance-based assessments work very well,” said Hagopian. He is hopeful the Seattle School District, with Superintendent Jose Banda now in charge, will rethink the test. The MAP was instituted under former Superintendent Maria Goodloe-Johnson, who passed away less than two years after stepping down in 2011. “I really hope that they would want the best for all their students,” he said. Seattle Public Schools expects our teachers to administer all required tests, pursuant to our policies and procedures. Last fall, during an annual report to the Board on Nov. 28, it was agreed that the District would review the effectiveness of MAP testing. We look forward to hearing from our principals and teachers as part of that process. A report back to the Board is expected to be presented in the spring. 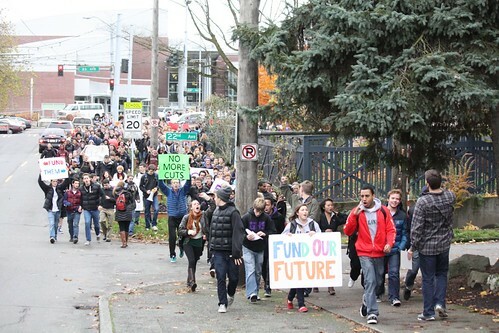 Though he has heard rumblings from faculty around the District, Hagopian said he is not aware of teachers at any other Seattle school taking such a stand. “But I welcome them,” he said. Police are searching for the suspect in a reported sexual assault at Horiuchi Park Friday evening. The alleged assault occurred around 7:10 PM. at the park, located at Boren and E Spruce, according to police. Though information is preliminary at this time, police confirmed that a woman went to the King County Juvenile Center and reported the incident within a few minutes of when it occurred. Police responded and searched the area for a suspect described as a black male in his 30s wearing a tan coat. 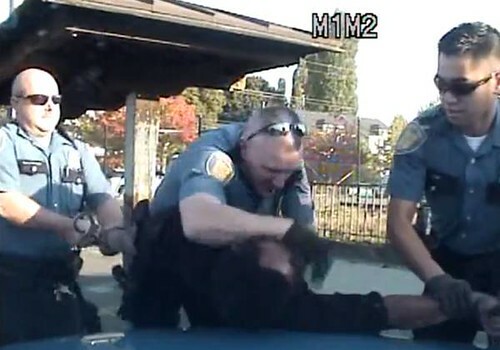 After weeks of requests, the Seattle Police Department released video of a rough October 6 arrest in the parking lot of the Midtown Centre at 23rd and Union. As CDN reported previously, the arrest left Leo Etherly with a bloodied face and shook the neighbors and workers who witnessed the incident. Dashboard video of the incident clearly shows the arrest, including a strike from Officer Eric Faust to Etherly’s face that sent Etherly to the hospital. Etherly was arrested on investigation of hit-and-run and assaulting a police officer, though both charges were quickly dropped. CLARIFICATION: The charges were referred to King County, which denied to pursue them. There is still a chance he could be charged in Seattle Municipal Court, says SPD. The video was not released until Etherly’s attorney James Egan filed a lawsuit alleging that the Department was illegally withholding the video. SPD launched an investigation into “a particular force tactic” used by Officer Faust. Shortly after the incident, CDNews spoke with several people who work or live in the area and saw what happened. They voiced concern that the force was not called for, and that the incident reinforces feelings of injustice between people of color in the neighborhood and the police department. Officer Faust was commended with a Medal of Valor in 2009 for stopping an unmanned car rolling down Jackson St after an officer-involved shooting at 20th and Jackson. Coincidentally, Officer Chin, who was also involved in Etherly’s arrest, was accused of using excessive force in the 2009 incident. One part of the Seattle Police Department’s 20/20 Plan, a response by the city to the recent US Department of Justice investigation, is a community outreach program called Safe Communities. The city has held meetings at every precinct in the city, wrapping up their tour with the Central District and Capitol Hill’s East Precinct Thursday. The meeting is 7-9 p.m. at Miller Community Center. Our Mission is to ensure the city is meeting our goal of reducing crime and creating the safest possible neighborhoods by deeply engaging with the community. This goal can only be accomplished with the support and partnership of the City, a broad base of residents and our police officers. 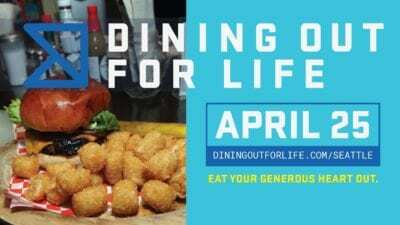 This initiative, therefore, is being launched in partnership with the Police Department and builds upon their already existing Community Outreach Initiative (#19 of the 20/20 Plan). This outreach mission is designed to increase and bolster SPD’s goal of providing a sustainable system of outreach to the community—reaching beyond individuals that traditionally engage with the police department—that will also promote equity and strengthen accountability and responsibility. This will be an opportunity for neighborhood residents to meet with each other and members of their precinct police department and other City Departments to focus together on concerns in their neighborhoods. After Thursday’s meeting, the second phase will start. 5-15 small group meetings will be held within each precinct. The groups will analyze data and review policy issues brought up in the large meetings. Then people from those groups and the city will come back to another round of precinct-wide summits, which should happen in March 2013, followed by a “report back” meeting in May to discuss actions taken and next steps. What will the future of bicycling on Capitol Hill look like? The city is developing an update to the Bicycle Master Plan adopted in 2007, and you will have your first chance to get a look at the draft network map of future bicycle facilities they have created. The first meeting is Wednesday, 5:30–7:30 PM at City Hall. There’s another meeting Thursday down south — hey, you could ride your bike. The City has been developing a vision of making riding a bicycle a comfortable and integral part of daily life in Seattle for people of all ages and abilities. 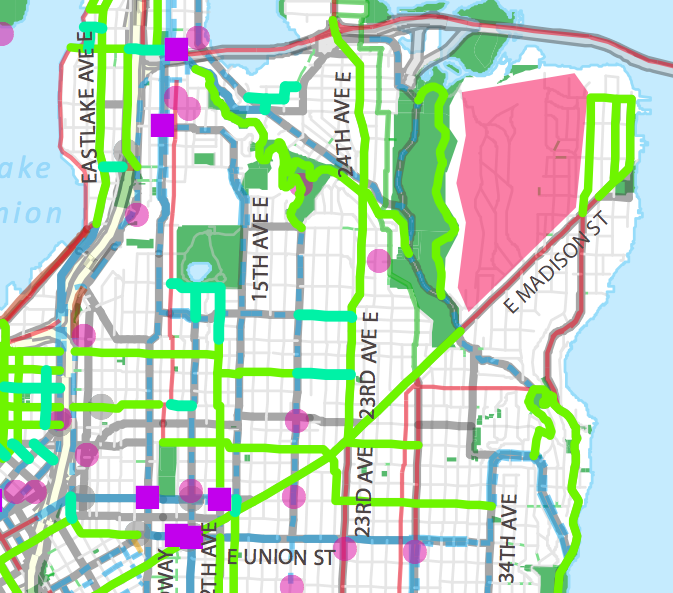 The Seattle Department of Transportation (SDOT), the Seattle Bicycle Advisory Board (SBAB), community members and local businesses have been hard at work over the past several months revising a citywide bicycle network map, and developing possible encouragement and marketing programs to achieve this vision. Three public meetings and an online Lunch and Learn are being held to get feedback at this critical juncture in the planning phase. 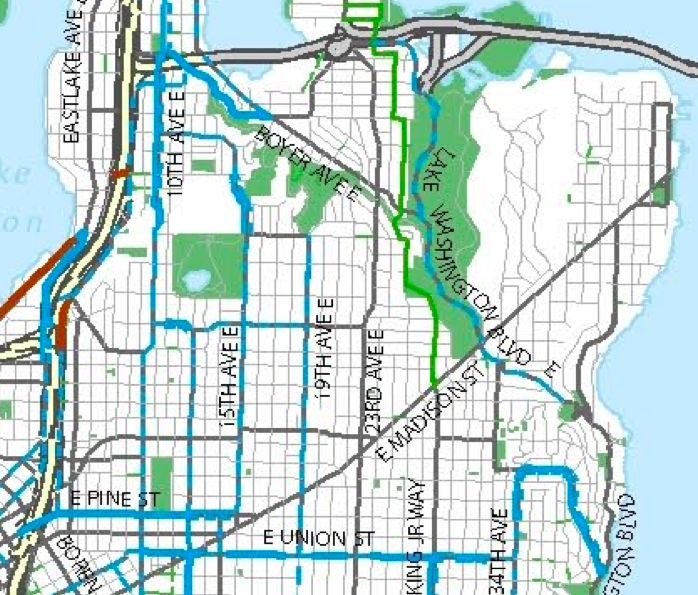 SDOT is sharing a draft citywide map of proposed bike facilities so that the public can provide feedback about riding bikes on the identified streets and if there are gaps. 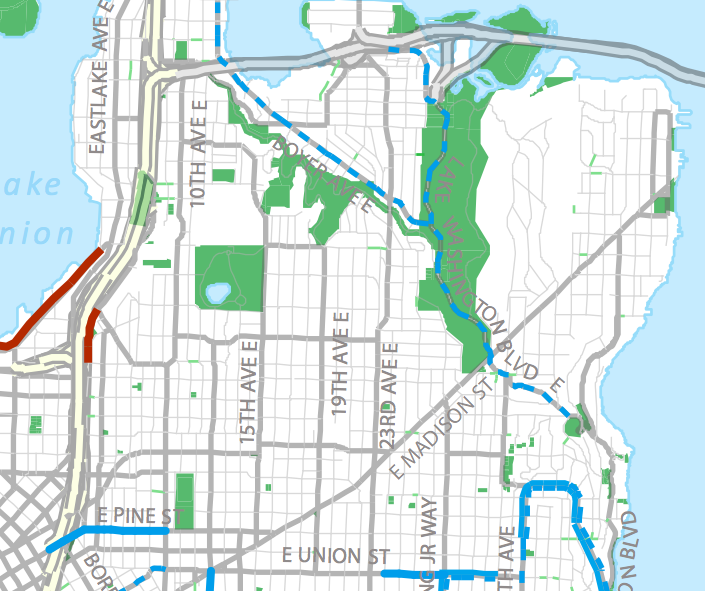 Different types of facilities such as Neighborhood Greenways and cycle tracks will be discussed, and staff will be on hand to discuss the overall policy direction of the plan update, trade-offs of adding bike improvements and the effectiveness of possible programs to encourage more bike riding. People unable to attend a public meeting are invited to participate in an online Lunch and Learn on November 15 from 12 to 1 p.m. Individuals can register at https://www3.gotomeeting.com/register/718370686. SDOT staff will provide an overview of material displayed the public meetings and the audience will be invited to submit questions. Space is limited. All of the work completed to date is available online at www.seattle.gov/transportation/bikemaster.htm. Click on the Project Library to read all the presentations given to the SBAB, the State of the Seattle Bicycling Environment Report and the Phase One Public Engagement Summary Report. The City Council is in the midst of hearings and meetings to discuss which parts of Mayor McGinn’s proposed 2013-14 budget to keep and which parts to scrap. 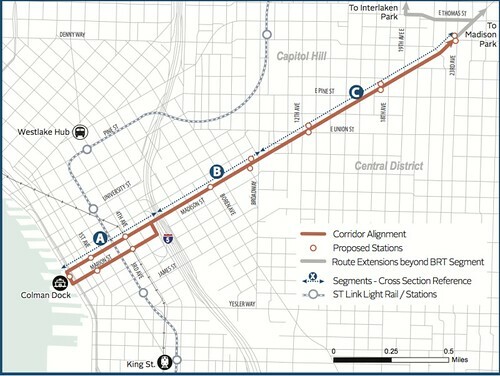 Among the council’s potential cuts are about $5 million in high capacity transit projects, including studies for high capacity transit routes to the U-District (likely a streetcar extension) and Ballard as well as the Madison bus rapid transit project between downtown and 23rd Ave.
All the projects are priority corridors identified in the city’s recently-completed Transit Master Plan. The Madison corridor scored well in the study for ridership growth. The TMP estimates 14,000 people would likely use the line, 6,200 of which would be new transit users. The grades are too steep for a streetcar, so a rapid electric trolley bus is the most likely option. The project would include new bus-only lanes and other streetcar-like features to help keep the bus running quickly. It would likely come every five minutes for most of the day and would cost about $81 million in capital costs before it could start. However, if you want the city to start studying this project, you might want to let the Council know. They are considering moving all or some of the money from these high capacity transit planning projects into other transportation projects, including increasing funding on the underfunded bicycle and pedestrian master plans, completing work on other priority bus corridors (of which there are several on the Hill) and adding it to the Broadway streetcar extension. The Broadway extension, which would continue the First Hill Streetcar from its current planned terminus at Denny Way north to Aloha, is still about $23 million short of being funded (the Puget Sound Regional Council recently approved $850,000 in federal and regional money to study the extension). The Council is scheduled to start voting on budget-related items November 7, and the final budget will be adopted November 19. Thursday was the second of two public budget hearings, but you can still send your thoughts to council@seattle.gov.